Hurrah! Hurrah! It is spring and almost summer! Today on the way home from church we bought strawberries - first time this season. 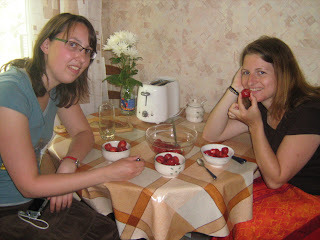 Alida and Katrin helped me to enjoy them - they were sooooo good! We also had new potatoes, cucumbers and tomatoes for lunch. Last week I was so pleased when the mechanic phoned me and told me that I would not need to buy a new car because he had done absolutely everything needed to my car and it was as good as new. I thought he meant it had been resurrected. And he had, in fact, put in a whole new suspension system so it does ride much better through the spring road repairs. 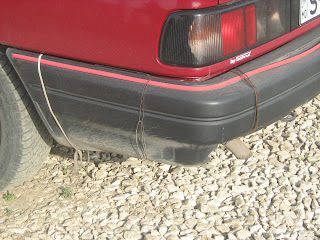 But for the amount of money I paid for "everything" to be done, I noticed that the rear-view mirror still is not in place, the back door still needs oiling, and the rear bumper is still being held on by wire and the string from my Tilley hat! So I think 'slightly revived' is a more appropriate term than 'resurrected'. Guess I'll keep looking for a newer car. The other day I gave you all a quiz but I got very few responses. Prizes will be sent to Dana & Cherise for correctly guessing that the gas is being installed for our new building. And Millie gets points for at least trying. Now for all the rest of you who didn't even try to guess, here's another little quiz. I'm looking for participation here! Look carefully at the metal thing in this photo and see if you can tell me what is its purpose? 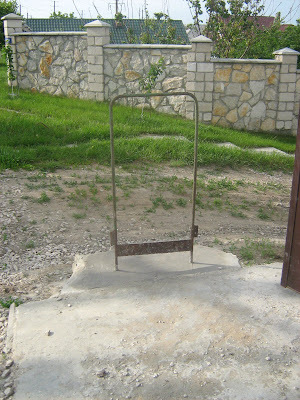 Sergiu spent some time the other day carefully installing this just outside the gate of our Training Centre. Posted by Barb at 5:13 p.m. It is easy to gues when I used it for years. I let the others gues it. Have fun, I am loooking forward to see the answers. Is it the begining of a catapult? If not, you should get one. It's either for chaining your horse and buggy too or it's the REAL playground you were going on about in you last blog. You used pictures from a Canadian playground, passed it off as a Moldovan playground, then felt guilty about it and put up the real playground picture. My prize had better be good. Umm... I feel like I'm cheating a little but it's set up to hook and beat rugs isn't it? I miss you Barb. Blessings dear sister.